If you have been reading my posts, you know how I feel about smoothies. I LOVE them! It’s my favorite way to pack a lot of nutrition into my kid’s diet. I also notice that when I am getting all of my fruits and vegetables, my skin and hair look better and my body feels healthy and strong. Providing energy from natural fruits and vegetables is the perfect start for your day. Let’s take the smoothie a step further and get out our spoons! 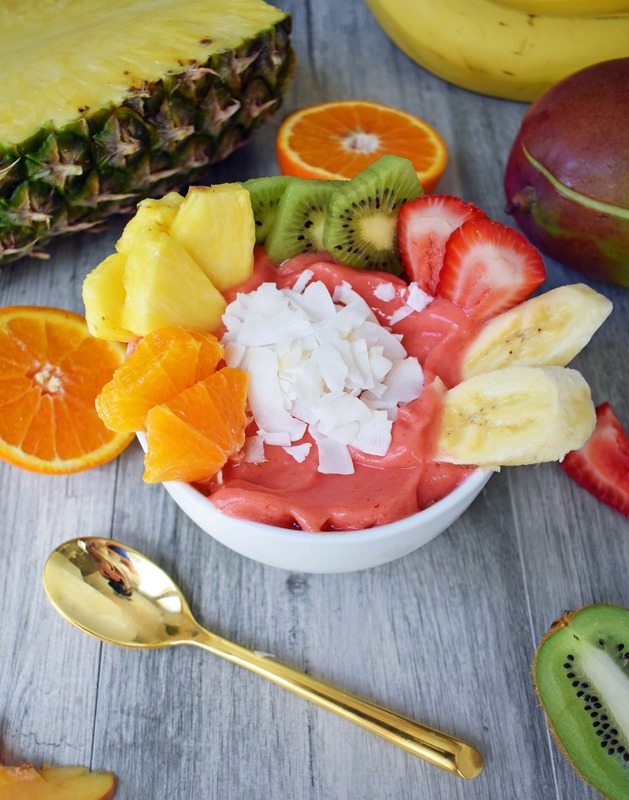 A smoothie bowl is a thicker smoothie, placed in a bowl and topped all your favorite toppings. A smoothie bowl is so filling! 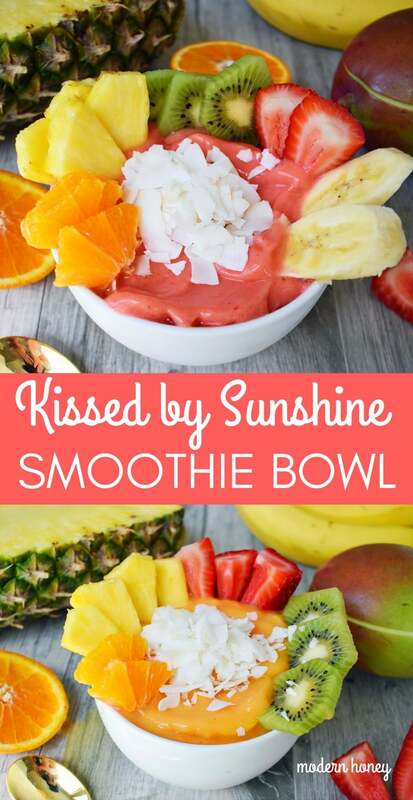 This Kissed by Sunshine DOLE Smoothie Bowl is made with Dole Frozen Fruit Blends, juice or coconut milk and topped with fresh strawberries, pineapple, kiwi, oranges, berries, and coconut shavings. You can add greek yogurt for extra creaminess and protein. Adding a touch of granola gives it that crunch and keeps you satisfied even longer. I recently taught a class to a large group of women on how to make healthy smoothies and one of the most important things I shared with them is the importance of using frozen fruit in their smoothies. I find that using frozen fruit removes the need for ice, which melts and makes the smoothie taste watery. Also, Dole uses sun-ripened fruit and vegetables that are picked at just the right time and frozen, so you get the ripest and most flavorful fruits. Use Frozen Fruit. I was so excited to try Dole Fruit and Veggie Orange Medley since it has mangoes, mandarin oranges, pineapple, bananas, and sweet potatoes. It’s a mix of tropical fruits, with a touch of veggies for that extra Vitamin A + C boost. I also tried the Dole Mandarin Sunshine Blend, which has pineapple, strawberries, and mandarin oranges. 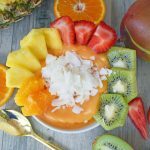 It’s a classic that everyone loves and is full of Vitamin C. This Kissed by Sunshine Smoothie Bowl has so many nutritional benefits. Choose your Favorite Liquid. You use less liquid in a smoothie bowl than you would in a smoothie because you want it to be easily eaten with a spoon. Think sorbet texture. You can use apple juice, orange juice, coconut milk, or almond milk. You can even use water! The apple and orange juices add some extra sweetness. You can also use unsweetened coconut milk which adds some creaminess. Add Greek Yogurt for a Protein Boost. Greek Yogurt is a good source of protein. Adding greek yogurt gives the smoothie bowl a richer and creamier texture. It is completely optional and can be made without it. I have experimented with smoothie bowls with and without it and I love it both ways. Eat your Greens! You wouldn’t believe how easy it is to sneak in some baby spinach without anyone noticing. It ups the nutritional value significantly without altering the taste. Give it a try! Add your Toppings. This can be the fun part! The sky is the limit on toppings. I love to chew my food instead of just drinking it, so the addition of coconut shavings, granola, and fresh fruit make it more filling. 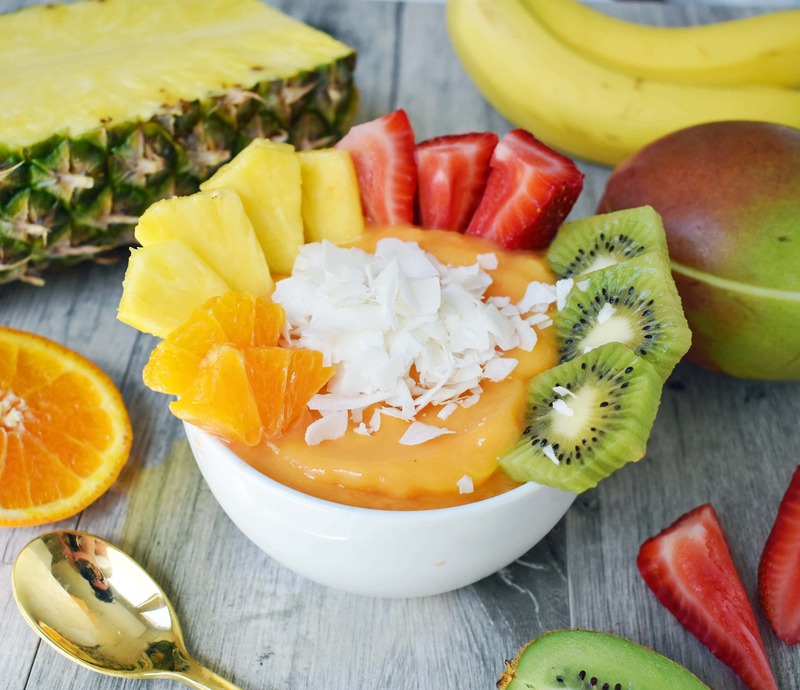 Smoothie bowls are nutritional powerhouses with their assortment of fruits and veggies. A perfect start to the morning or a great afternoon snack. 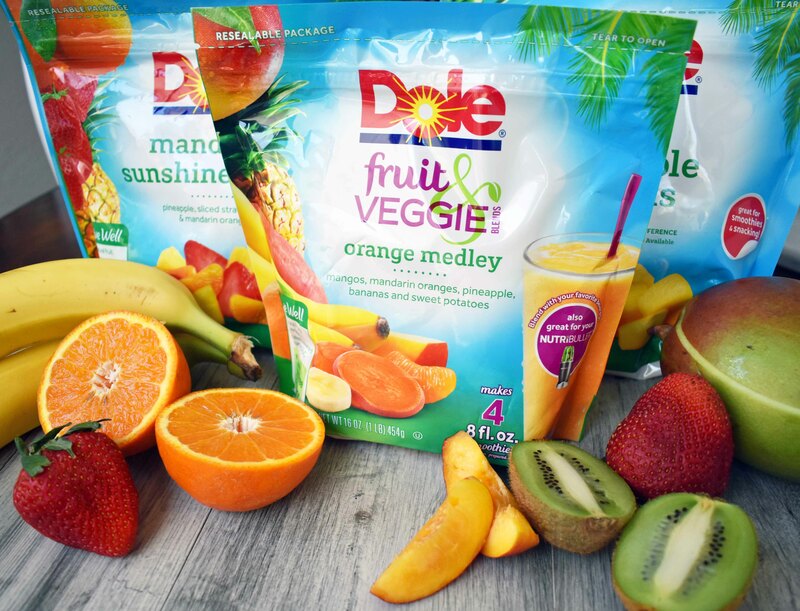 In blender, mix Dole Fruit Blends and liquid of choice. Start with the smallest amount of liquid and build up until desired consistency. The smoothie bowl should be thicker than a smoothie so it can be eaten with a spoon. Add greek yogurt and spinach, if so desired. Blend until smooth. Pour into bowls and top with your favorite toppings. 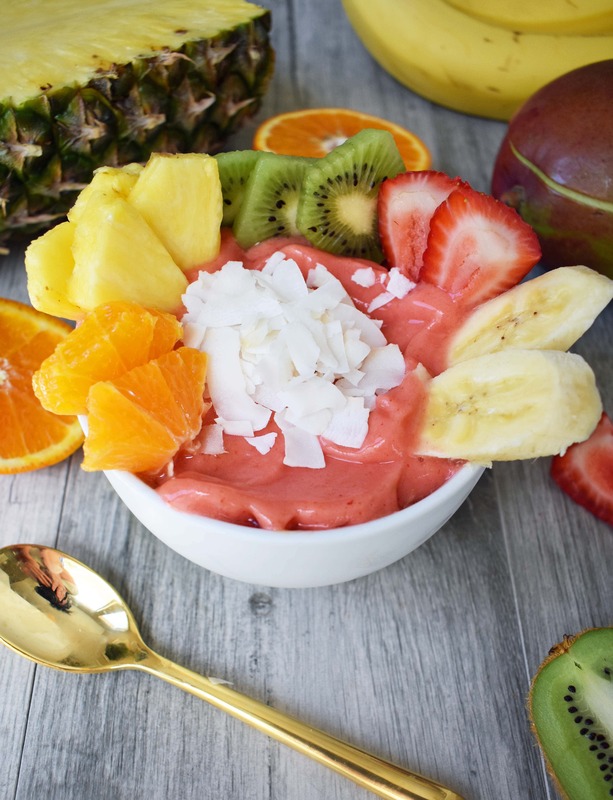 Who else loves smoothie bowls? I would love to hear your favorite things to put in your smoothie bowls. Have a fabulous day, my friends!